With zipForm® Standard you'll spend less time managing paperwork and more time closing the deal. With zipForm® Standard, there's no need to maintain a bulky inventory of stored documents or waste time searching through stacks of printed forms - approved forms are just a few clicks away. zipForm® Standard can help you speed up the process by sharing data between all documents related to the same transaction - simply fill out one form and the information is automatically shared with all of the forms required to complete a transaction. Enhanced Tabbed User interface for easy navigation and improved workflow. 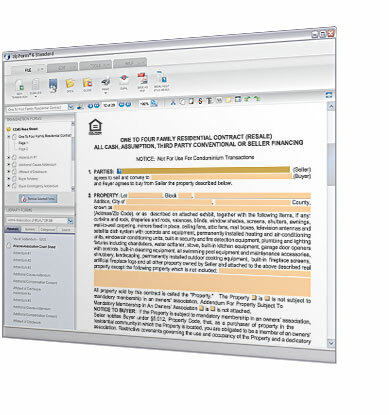 Email selected pages or an entire transaction as single PDF or individual PDFs.